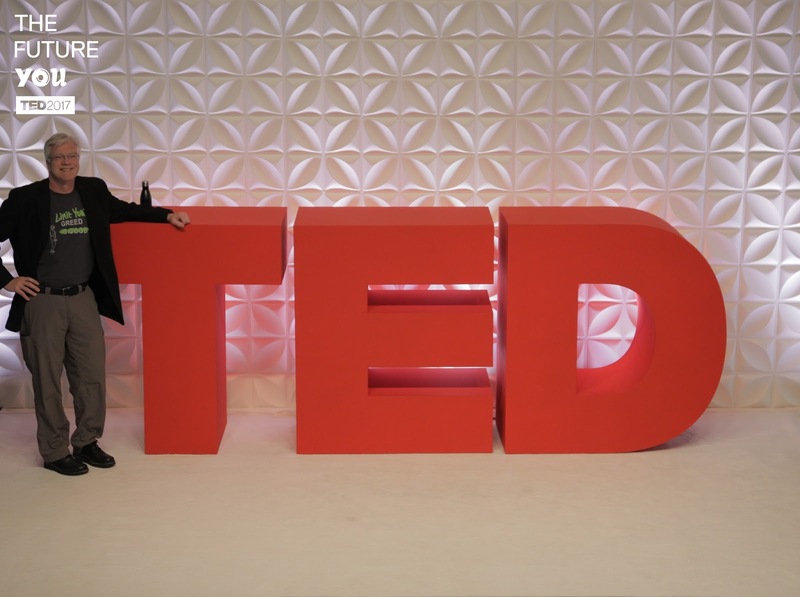 This is my tenth year of attending the TED or TEDActive conferences. The conference is again in Vancouver, BC. The weather reports said it was supposed to rain, but instead it was a beautiful, clear day in the 50s. 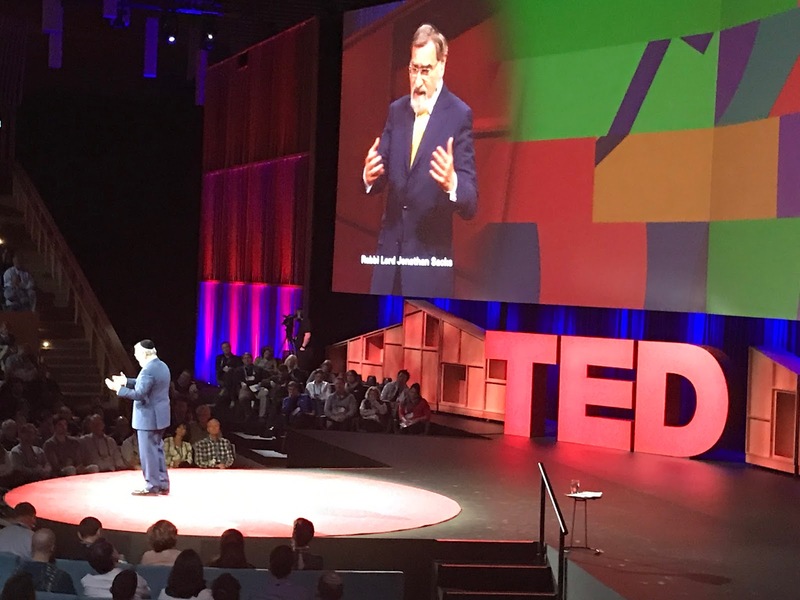 I come to TED every year primarily to have the talks force me to think. I do my best to attend all of the talks and even try to talk to some of the many interesting attendees. Being here every year really pushes me outside my comfort zone, but I look forward to it. What I never know is what I will learn, what Mark and I will decide to do based on what we learn, and how I will change. It is always a bit scary, but something I have come to treasure. It also forces me to write some blog entries. Last year, the four entries about TED were the only ones I managed to write. I'm hoping this year I can do better than that! 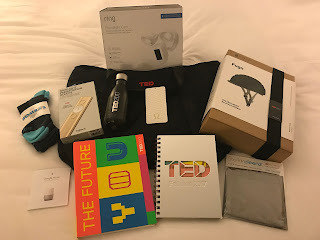 One of the treats each year is the TED gift bag. Over the last few years, the gift bag has become less over the top than it once was. That is probably a good thing, but there were still plenty of interesting items. Among the items I'm looking forward to trying out is a Closca Fuga foldable/portable bike helmet, a pair of Bombas socks (what Toms is to shoes, they are attempting to be to socks), a Logitech presentation remote, and a Ring outdoor floodlight and security camera. There is also a card to get a free Google Home. The TED bag itself is a large one from Lululemon with lots of places to store stuff. The first day started off with two TED Fellows sessions. 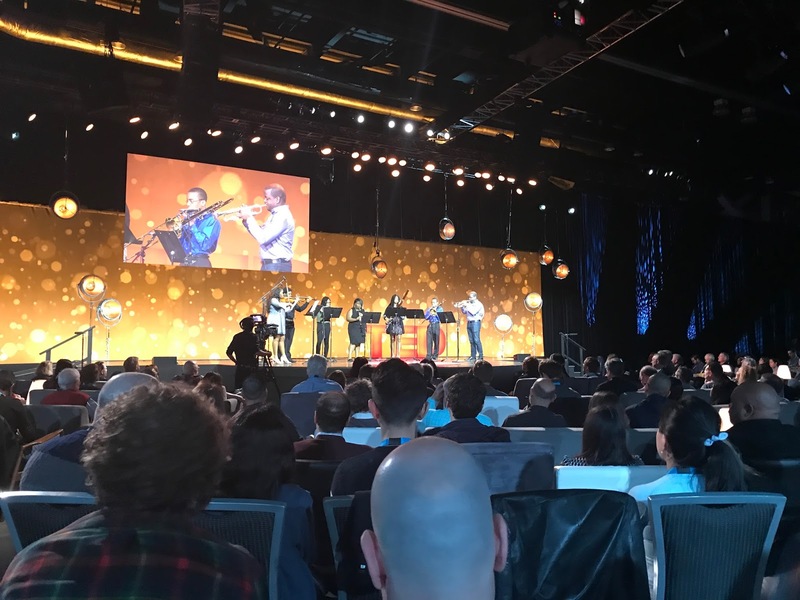 These talks are typically shorter than the ones on the big stage and are done by some of the over 400 folks from about 90 countries around the world that serve as TED Fellows. The sessions included quite a few good talks, though no great ones. The sessions opened with a performance of the Shaker hymn Simple Gifts by high school students from Play on Philly. I've always loved the melody as it was used in the song Lord of the Dance that was very special to me when I first became a Christian. 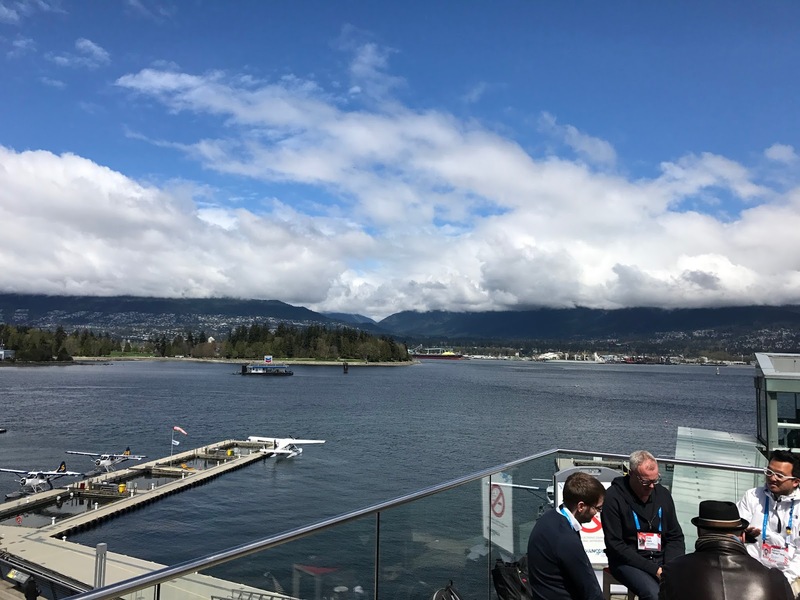 Here are just a few of the highlights of the two sessions of talks. Karim Abouelnaga spoke about his efforts to utilize summer school with inner city kids so they might learn rather than fall behind during that time. His initial results sounded very promising. Greg Gage did a fun demo with plants where he used something akin to an EKG monitor to show how some plants reacted to external stimulus. He capped this off by hooking a Venus flytrap to a mimosa with wires and then causing the mimosa to droop by touching the Venus flytrap. Rebecca Brachman talked about her work on a drug which in lab animals can prevent PTSD and depression. She called the drug a resilience enhancer. She does not yet have any results from humans, but the possibilities are certainly exciting. If successful, her hope is that similar drugs can be found for other psychiatric conditions such as OCD. I was left wondering and worrying what the unintended consequences will be if such drugs remove those conditions from society. I'm sure few parents would want their children to suffer from those things, but I also know that there are useful personal and societal results from them. The talk was very thought provoking. The highlight for me was Manu Prakash's talk on what he called frugal science. His basic idea is to make science cheap and accessible in every corner of the world. Previously, he and his team created the Foldscope, a $1.50 microscope for spurring science learning in impoverished parts of the world. His current work is on a 20-cent centrifuge (he called it the Paperfuge) for use in blood tests in places with no electricity. There were plenty of other good talks such as Damon Davis' on his documentary about Ferguson, Missouri, but I don't have the time to write about all of them and get to today's sessions! Between the two TED Fellows sessions we had a "picnic" lunch. We had to form a group of six people in order to get our lunch basket. While I'm not a big fan of this, it did force Mark and me to eat and talk with folks we did not know. We sat with a couple of Brits, a woman from MIT, and another person. After the usual discussion of the best talks so far, the conversation veered into politics. The best line was when one of the Brits said that while both Great Britain and the US had made big mistakes in their recent elections, at least the US could fix its in four years. Folks in the group felt it was unlikely that there were any Trump supporters here at TED. I'm sure with over 1,000 attendees, there have to be some, I expect there are not many. I'm going to see if I can find any over the week and talk with them. 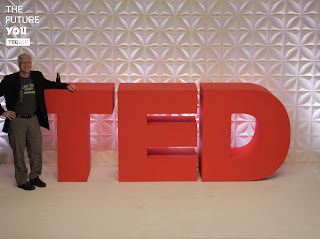 At 5:00pm, the actual TED talks began. It was the best opening session of talks that I can remember. While none of the talks were amazing, all of them were good and a few were great. I only have time to discuss a few of them. The musical group OK Go is widely known for their amazing videos, like Upside Down & Inside Out. On the TED stage they both performed live the songs to a couple of videos I'd not seem before and gave a compelling talk on creativity. I'm still thinking about whether their process would work for me, but it was intriguing. You have to see this talk once it is live. Titus Kaphar is an African-American artist who told a story of how his son wanted to know why Teddy Roosevelt got to ride a horse in the statue in front of the NY Natural History Museum while the American Indian and African American in the statue had to walk. Kaphar then talked about African Americans in art while painting over a copy of a classic painting that he had painted. What he was doing was obscuring the white characters with white paint so the African American, usually in the background, would come more into focus. It is very hard to adequately explain what he did, but I was moved by it. 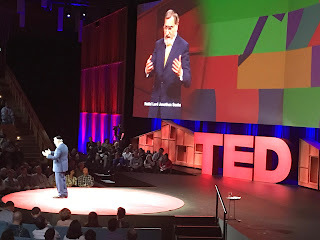 The talk by Rabbi Lord Jonathan Sacks was very good, but ultimately frustrating. He was an amazing speaker. He posed the question, "Who do people worship?" He answered by saying that today we worship ourselves. He used many quotable lines such as, "It is the people not like us that make us grow." I think he was dead on with many of his observations. He concluded with a line from the 23rd Psalm, "though I walk through the valley of the shadow of death, I will fear no evil because you are with me." He used the "you" in that phrase to say that by being together with others we could overcome the trials of the world. My quick check of the Hebrew was unable to show he was wrong, but I've always understood the passage to refer to God. The following phrase, "your rod and your staff, they comfort me," certainly does not seem like refers to other people. To me, what he urged people to do is move past the worship of self to a worship of us. That seems consistent with Sacks' stance as a Jewish Universalist. Instead, I would argue that we need to replace the worship of self with the worship of God. The day ended with an evening kickoff party. The food was interesting (in a good way) and I did have my first real conversation about LYG prompted by the Limit Your Greed shirt I was wearing. It obviously didn't change the world, but it was a small step. I'm hoping to have more conversations during the week.